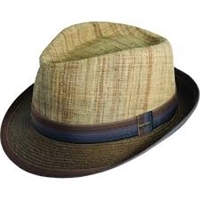 This is a matte raffia and paper braided fedora with a stripe ribbon trim. It has a 2" boad brim and a ton of style. This poly braid 4-3/4" brimmed hat is so light weight and beautiful!! The small side flip is flattering on all face shapes..
Scala- Lamp Shade Sinamay w/ Metallic Design. Made of 100% Sinamay. One Size. The Kentucky Derby or that special summer event, this will dazzle them! This gorgeous hat is made of Sinamay straw with a 4 1/2'' slit brim and adorned with lovely rosettes on the side. Adjustable inner drawstring.. So light and beautiful, this 4-1/2" brimmed sinamay will be sure to complete your look. Adjustable inner drawstring. Scala- This fun Snake Print Sinamay hat is sure to be a hit! Made of 100% Sinamay. One Size. A Kentucky Derby Knockout! So, so lovely…. This 4" brimmed sinamay straw beauty is so versatile to wear with many colors…Adjustable inner drawstring. This gorgeous 7'' brimmed Sinamay hat with netting and feathers is going to be a knockout at the Kentucky Derby!